Use good paper! The quality of your card cannot be any better than the paper it’s on. 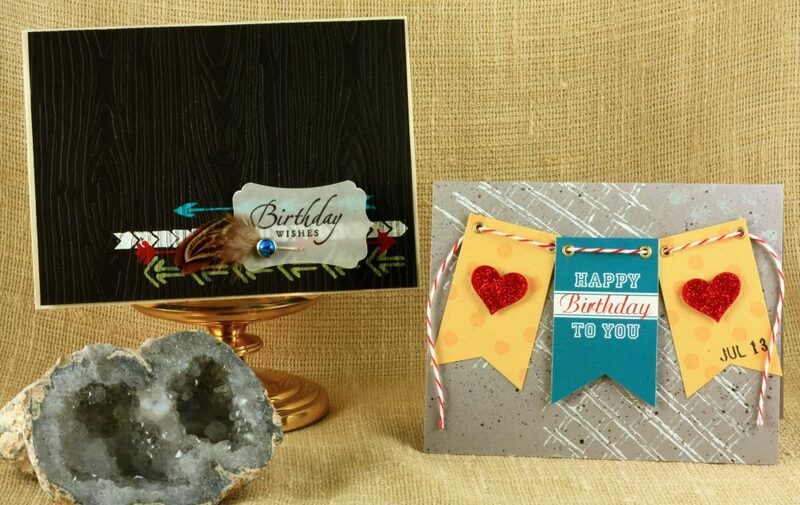 Look for heavy weight cardstock to use as card bases, textures and patterns are a bonus. Score your folds first and use a bone folder (or the back of your scissors) to get clean sharp folds. Negative space can be a positive! You don’t have to fill the entire front of your card; figure out where you want your focal point to be and then leave plenty of background exposed. Don’t be afraid to stamp or draw off the page when creating your own backgrounds. Take note of most pattern paper, designs tend to extend beyond the page. Mix your medias. Paint, ink, pencils, texture pastes and powders can all work well together, especially when creating backgrounds. Add dimension: use premade 3-D embellishments, create 3-D embellishments with foam tape, add ribbon, staples, multiple layer and/or textures. See our Embellishment Idea Sheet for more ideas. When using ribbon, clip the ends at an angle or into a dovetail. This looks better and helps prevent unraveling. When you see something that inspires you, ask yourself what about it you really like. Is it the color scheme? Perhaps the shape or design layout? Take notes and refer back when you start your next project. Sign the back of your cards; it helps finish your project. Stamp or slightly embellish your envelopes (just hint at what’s inside; don’t give it all away).